First it was there. Now it’s gone. 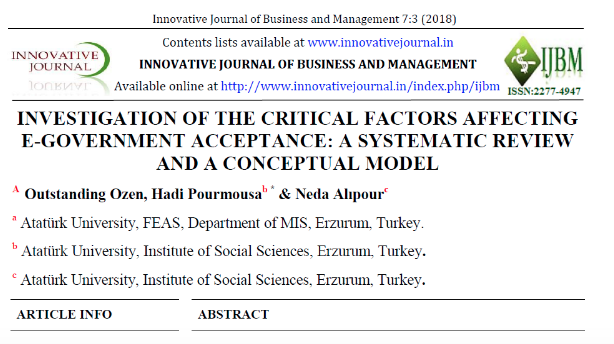 In March 2018, three researchers at Atatürk University in Turkey published“Investigation Of The Critical Factors Affecting E-Government Acceptance: A Systematic Review And A Conceptual Model” at the Innovative Journal of Business and Management, where it was freely available during 2018. It has no DOI, and no citations (that I know of). Now it is gone; the link is redirected to the journal’s general search engine. A search for the title or authors there yields no hits; neither do the Google references to the article nor resources around it. The March 2018 issue has now an unexplained hole from pages 77–84. The Google Scholar index for this article disappeared in March 2019. After reading the article in December 2018, I contacted the authors about two issues. First, the article is a meta-analysis of 31 studies of the Technology Acceptance Model (TAM), a way to measure acceptance of software, which in the studies in question was used in the evaluation of e-government. One of the studies is Lin et al. 2011, which I have elsewhere showed is seriously flawed. My question to the authors was if, or how, they conducted a quality check of the 31 chosen articles, and if the inclusion/exclusion of such an article could potentially change the outcome of their own study, or reflect on its validity. Second, the name of the first author of the now-disappeared paper was listed as “Outstanding Ozen.” Of note, the Turkish word üstün means superb or excellent, but is also a first name (much like the first name Magnus). My question to the authors was how (when and where in the process) this could have happened, and if this means that other parts of the article also could have been (machine) translated without the authors’ knowledge. The authors did not respond to my questions, even after confirming that their email addresses were correct. But soon after, the article disappeared from the journal, without leaving any trace; no explanation, no notice. I contacted the journal about this in January 2019. Despite repeated efforts, I received no answer from them either. Retraction Watch has been writing since at least 2013 about why simply making an article disappear isn’t a good idea. Perhaps the authors or the editor hoped that the article will just be forgotten. That’s already worked on Google Scholar. 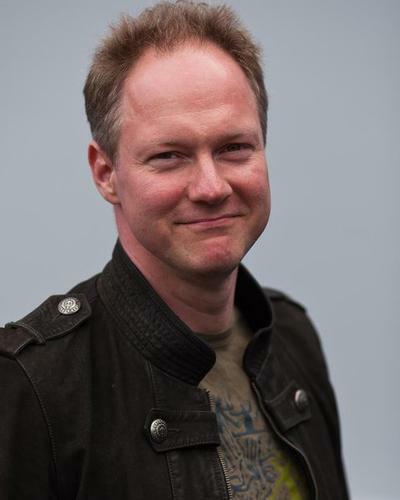 Daniel Jung is an assistant professor in the department of linguistic, literary and aesthetic studies at the University of Bergen in Norway. The journal website is riddled with typos, poor writing and broken English. Based on my review of the site, I’m not terribly surprised at their actions in this case. There are least three other journals with exactly the same “Aim and Scope”. I wonder if there is really a need for so many management research journals with exactly the same scope? Love your work. Keep up the vigilance. Hey, but in the EU the right to be forgotten is a fundamental human right. At least for the bad papers. Thank you. I could not find this at https://doaj.org/ – could you please provide the source? Thanks. Exactly. Unfortunately the link disappeared from my comment.